So I'm in a sewing mood lately. I go through these moods. For a while I'll be in a mood to make cards or scrapbook and right now the mood is sewing. To celebrate I went and spent way too much money at the local quilt shop today...but they were having a sale. So that makes it okay. So anyway my new cupcake pincushion got filled up with pins pretty quickly and I realized I may need more than one. Before this I just put all my pins in an empty butter tub and would poke my fingers getting them out. It is convenient to just throw the pins in, but like I said, getting them out is another story. 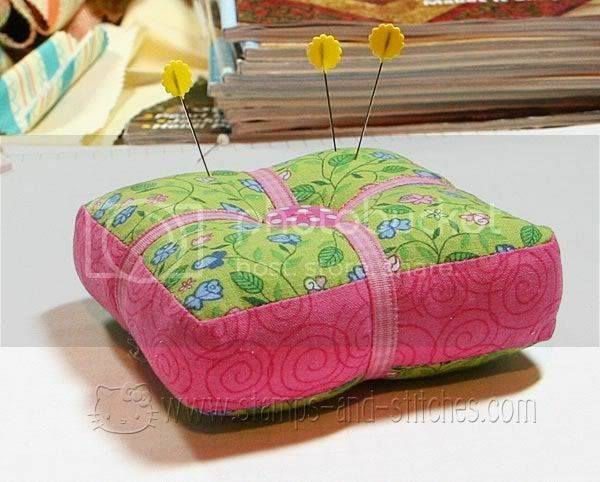 I liked using a real pincushion so well I decided I better make another. I saw this one in a Quilts and More magazine a couple of years ago. It's also online now-you can see it here. Very easy to make the actual fabric part but the ribbon was a little bit of a bear because I didn't have a proper doll needle and the buttons were tricky because they're so tight against the fabric. But it came out pretty darn cute, I think. And it holds pins, which is what's really important. This is darling!! I love the colors! What a great pick me up on a snowy day! Gale this is so cute! I love the polka dot button! 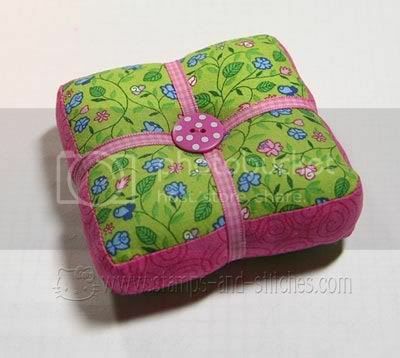 You are a very talented woman...I can't sew to save my life, especially little intricate things like a pin cushion! :) Very nice! Precious! I love your choice of material too. I'm off to check out that site for the instructions. Love this! Cheery colors and a precious design... great Job! This is so sweet. Great fabric and that button is so cute. Oooh, pretty! So much nicer than the pencil erasers I stick my needles in. Then again, I only sew when it's necessary. I wish I could do things like this! Oh, this is so pretty! You did an excellent job, it looks perfect. What a great gift idea this would be. Love the colors you picked to use together! what a cute little pincushion. you do a great job with the sewing.